who provide service dogs to veterans suffering from PTSD. 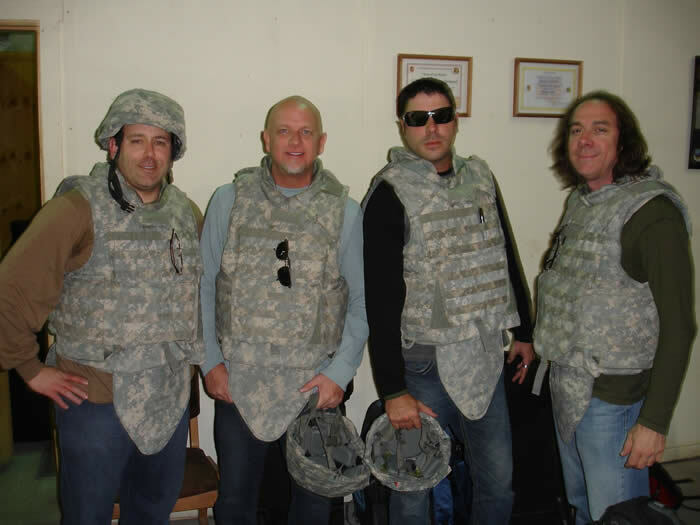 Battle Comics Keith Lyle, Don Barnahrt, Slade Ham & Jeff Capri geared up to go into Afghanistan & ready to entertain! 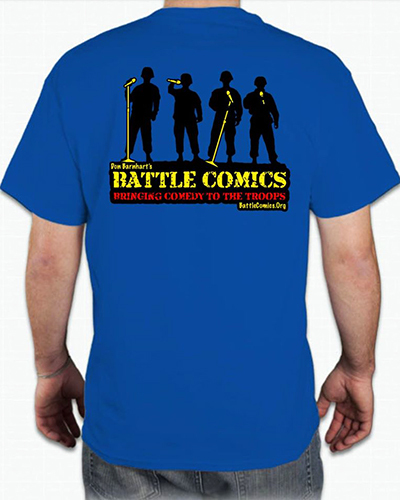 Get a Battle Comic Tee Shirt and help bring more comedy to those that serve. 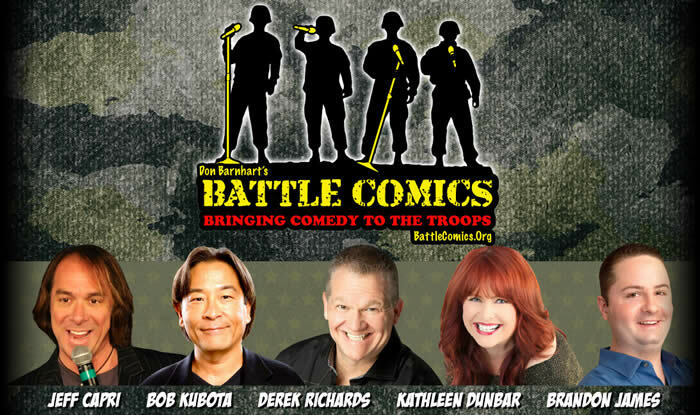 Inspired by Bob Hope's legacy, Don Barnhart's Battle Comics are dedicated to entertaining the troops and bringing even more comedy shows to the men and women serving around the world in the United States Armed Forces. 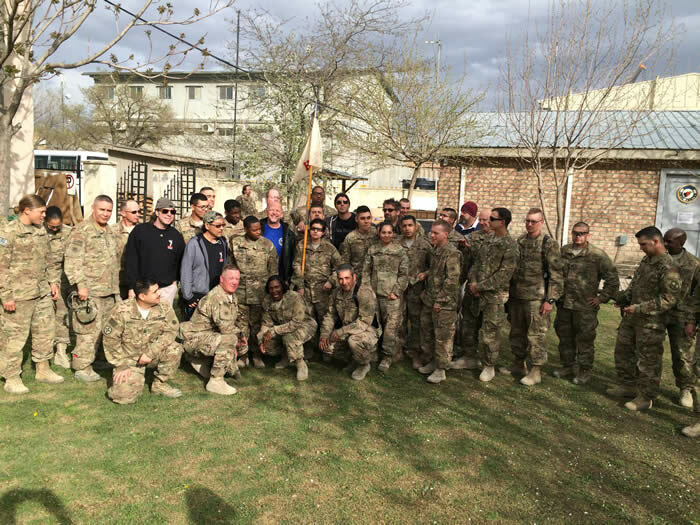 Already this year, Don Barnhart has brought his Battle Comics Tours to Iraq, Kuwait, and is sending out more tours as well as doing numerous benefits and fundraisers for those injured during battle. 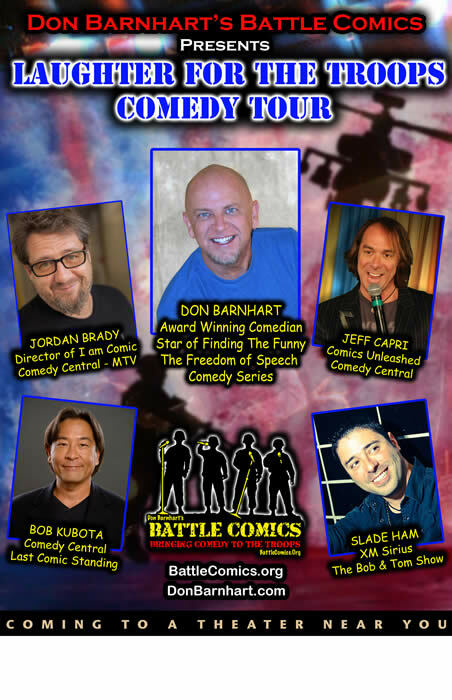 Battle Comics were featured in the upcoming documentary I AM BATTLE COMIC by filmmaker Jordan Brady. 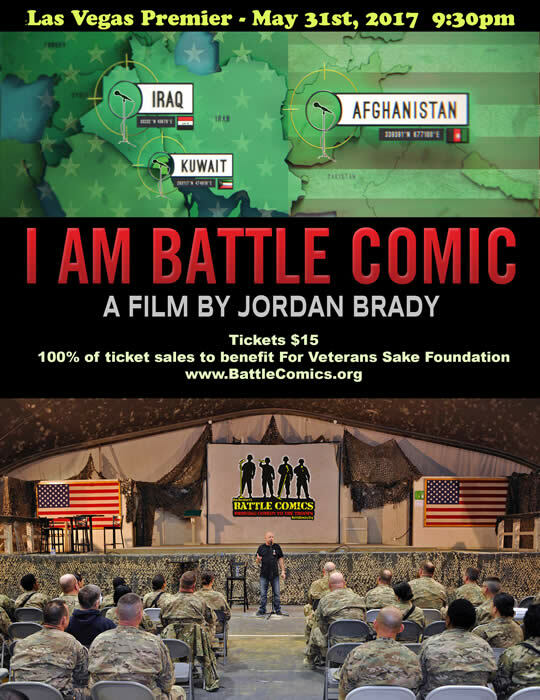 I AM BATTLE COMIC Extended Red Band Trailer from Jordan Brady on Vimeo. 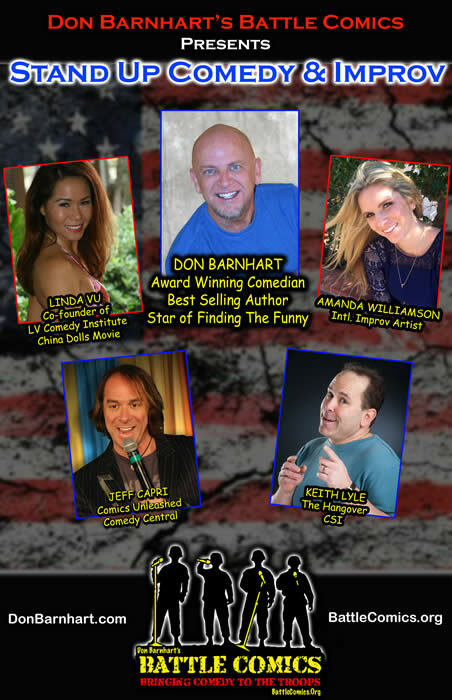 Since 1992, award-winning comedian Don Barnhart has both performed and produced comedy shows for the U.S. Military. 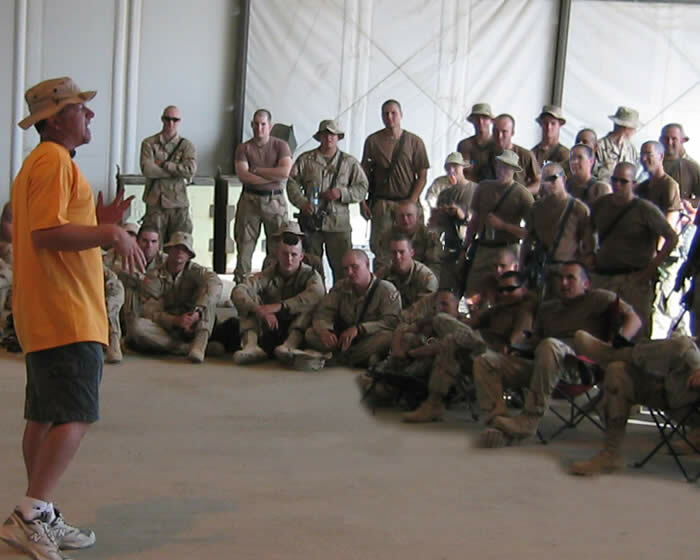 From independent and self-funded tours, benefits and fundraisers to the USO, Comics on Duty and Armed Forces Entertainment, Barnhart himself spends several weeks a year commited to entertaining the troops. 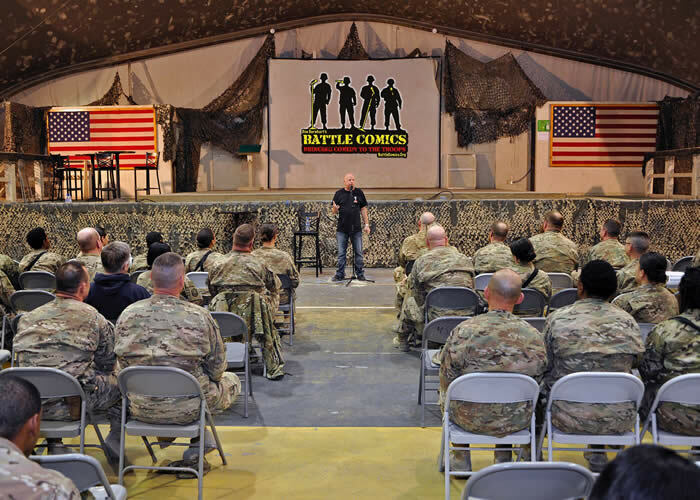 Don Barnhart's Battle Comics performing in Afghanistan! War and combat are one of the most stressful things a soldier will face and although they train for it, it's not always easy. 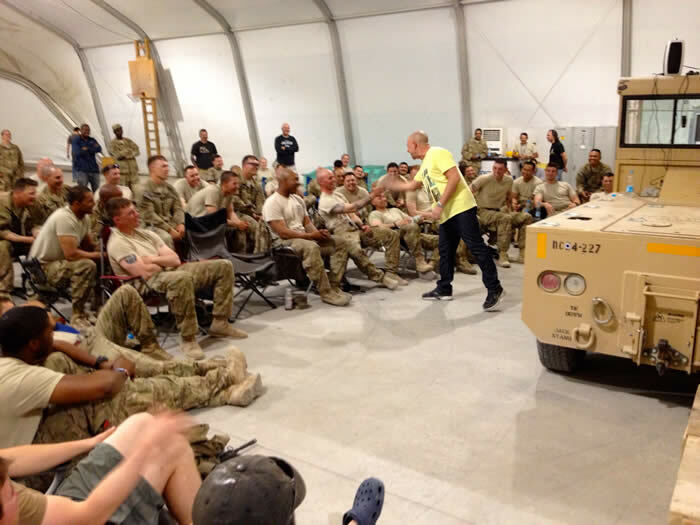 Right now, we are seeing a huge increase in suicides for the soldiers and providing comedy shows for the troops is just one of the many ways our nation is trying to deal with this tragic issue. 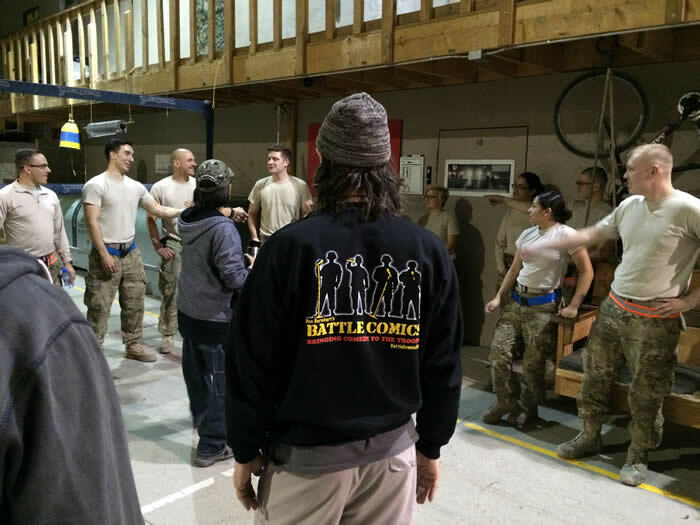 Battle Comics doing a private show for those that couldn't make the event. Don Barnhart and his wife Linda Vu have also personally produced their own tours as a way of saying, "Thank You" to the US military for all their sacrifices that they make during their tours of duty. 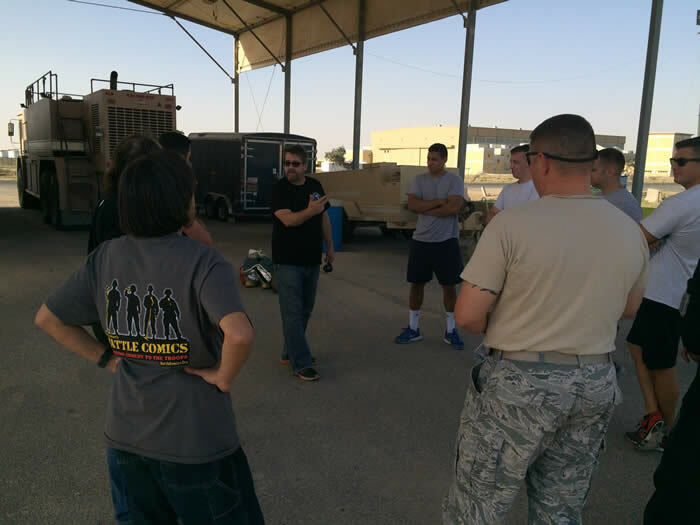 Battle Comics meeting with the troops serving in Afghanistan! 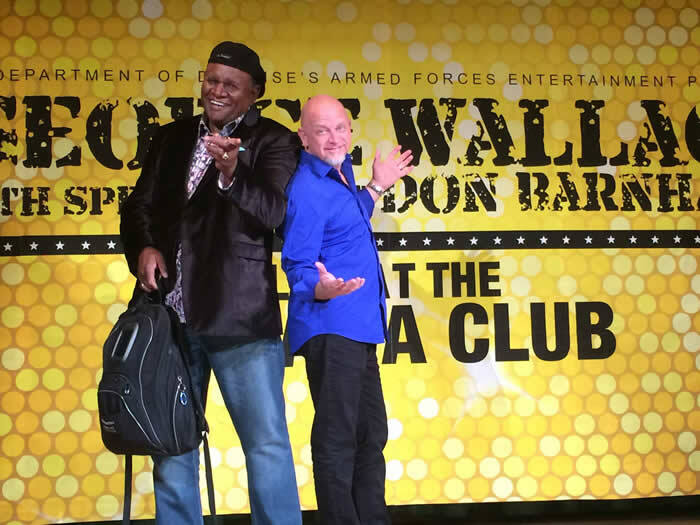 Our goal is to boost the morale and welfare of the men and women serving their country by bringing them the highest caliber of professional entertainers in the most cost-effective way. 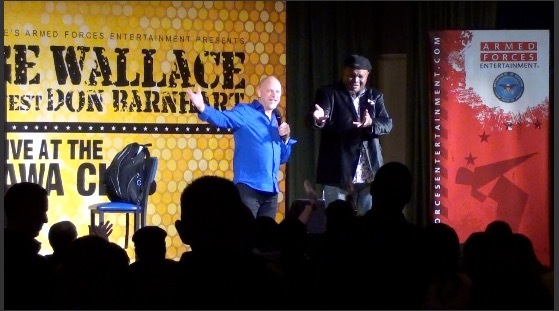 Comedy shows have the unique ability to easily fit the largest venue to the most remote base with virtually no set up time. 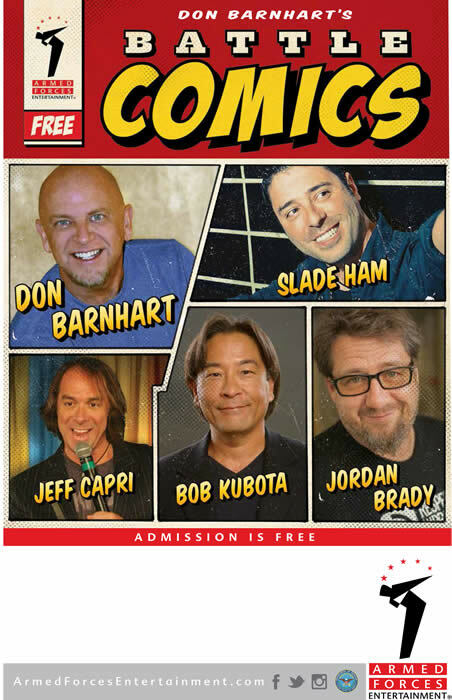 If there is a crowd, Battle Comics can and have done a show! 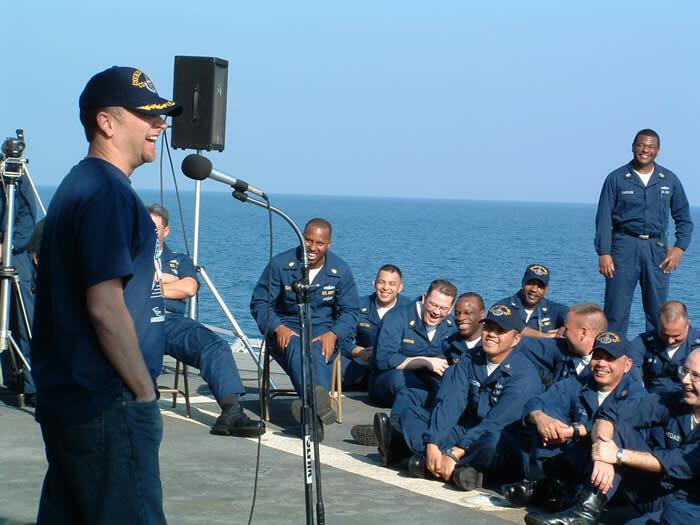 From ships to remote bases and the front lines, comedy shows have the benefit of little to no set up time. It has been said, “Laughter is the best medicine”. 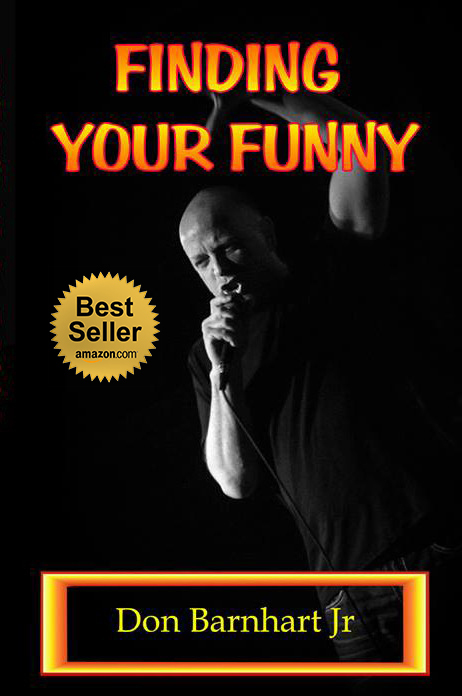 It also turns out that comedy can be a preventative medicine as well. 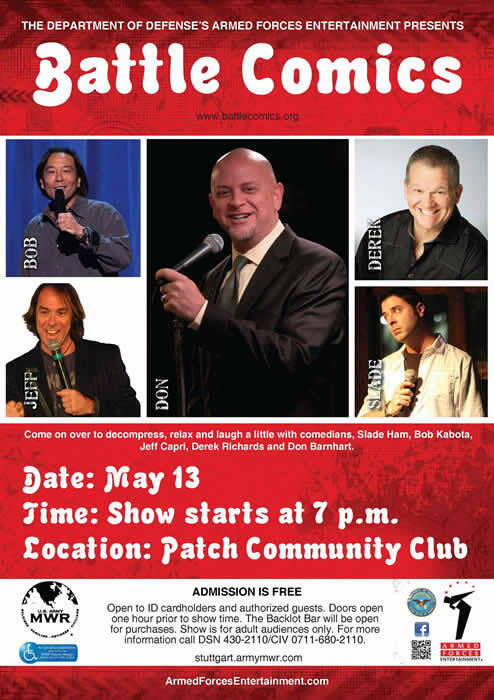 For years, stand up comedians have been entertaining the troops in war zones and on the front lines and Bob Hope really started it by showing the importance of bringing a piece of home to the men and women serving in the military. 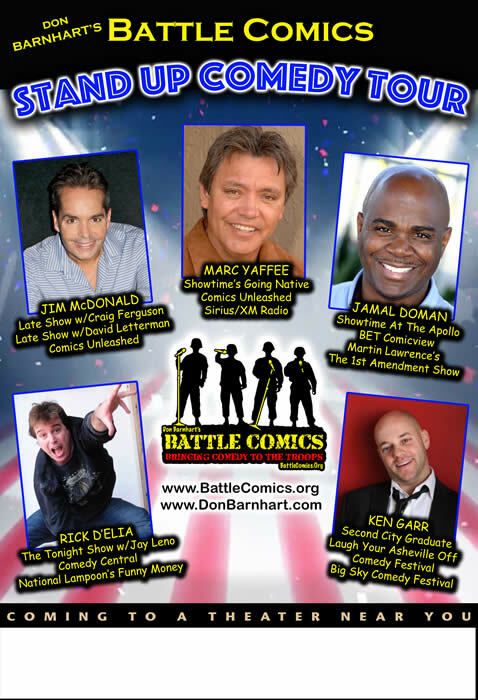 Don Barnhart’s Battle Comics team has already scheduled 3 tours and 2 benefits for 2017 but would like to do even more. We are seeking more sponsorship to help underwrite the cost of boosting the morale of those serving their country stationed away from home. 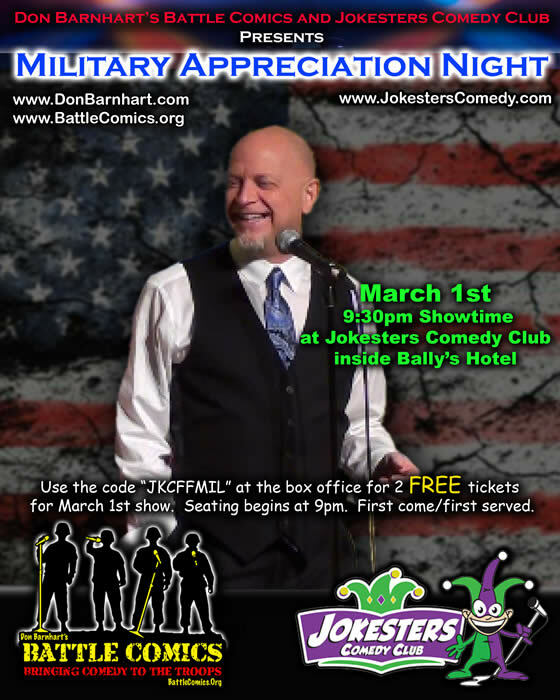 By sponsoring a Battle Comics World Tour as the “Title Sponsor” your company will provide for 12 (two week) tours over the course of a year that will run both domestic and overseas reaching up to 500,000 personnel at the 270 military installations around the globe. The importance of these performances brings a piece of home to those stationed far away from their loved ones. 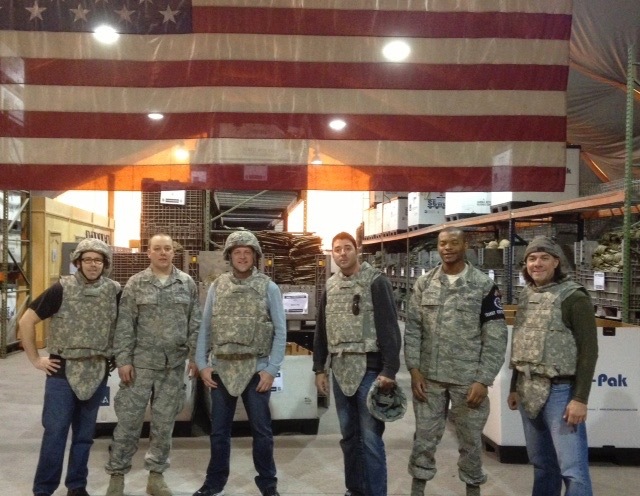 Please join us in supporting the troops by sponsoring a tour and help us bring laughter to those dedicated Americans protecting and serving our country.